Imbuing technology with an element of surprise and humour, Jeppe Hein’s interactive works playfully remind viewers of their vital part in activating art’s communicative potential. At first glance Hein’s sculptures appear to be uncomplicated, formally simple affairs possibly nodding to 1970s conceptual art and minimalism, but something happens as they are approached: they react to human presence. 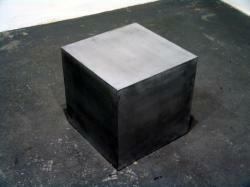 Shaking Cube (2004), an aluminium box placed directly on the floor, starts to vibrate when a visitor goes near it, stopping after a few seconds only to begin trembling again if the invisible field of motion sensors around it is entered again. We know it’s not alive, but it makes us take another look. Its sudden frantic movement and noise have a somewhat slapstick quality – think wind-up chattering teeth – but its animation is also disquieting, automaton-like, as if expressing alarm, a warning about something we cannot understand. 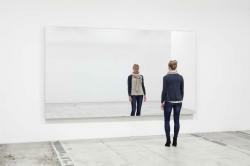 Something similar happens when visitors get close to Mirror Wall (2010). What at first appears to be a large but straightforward mirror begins to move slightly when approached. Viewing one’s vibrating reflection in it and the accompanying distorted backdrop of the gallery space creates a sense of dizziness and a strange feeling of separation from the familiar. It prompts us instinctively to re-calibrate our spatial awareness and our relationship to what we see and where we are. Kopenhagen met Jeppe Hein to have a chat about his exhibition at Galleri Nicolai Wallner. His work is minimalist, the ideas stripped of unnecessary noise and presented in their purest form, invitingly clear for the viewer. You’ve been looking forward to having a show here in Copenhagen at Galleri Nikolai Wallner. Yes – it’s always been one of my big goals to exhibit at Wallner, ever since he started his own gallery. Last year, when I had an exhibition at Galleri Johann König in Berlin, Johan arranged a meeting for me with Nicolai, who was down there to see the show. I’ve been wanting to show the home public what I’ve been up to, but I’ve only ever exhibited abroad. Now people can come in and see my work in person, instead of seeing and hearing about in via other media. You’ve created a show that involves the entire gallery; what have you created, and why? It was a long process, figuring out exactly what I wanted to do with these rooms, and I went through many ideas. This is the first time I’ve chosen to show the actual process. Along the Project Room’s one wall I’ve hung 44 sketches of all my ideas and thoughts about what I could create in the space. The other wall shows what I chose to create in the end. With this exhibition I’ve been thinking about the gallery’s situation, and how it presents and represents art. How artists can go into an exhibition space and use it to stage their art. My job has been to find out how I, with the room as frame, can make my work function best, while maintaining a relationship with the room itself. I chose to take my sketches along because they communicate the reduction process that led to the exhibition. Jeppe Hein’s works address us individually; though, importantly, we might not have asked them to. Hein delights in apparently serendipitous events, suspending common sense laws of cause and effect and conjuring up scenarios in which, in direct response to our presence, seemingly sentient behaviour is coaxed from inanimate things. In some of his pieces he articulates a dialogue between the work itself, the person encountering it and the gallery space in which it is sited – though this is a conversation for which one is wholly unprepared. Works of this kind imply a wry relationship both to the Minimalist sculpture of the 1960s and to those forms of institutional critique that sought to question the authority of the museum or gallery space. Yet Hein’s practice does not really fit either tradition – the mode of address and playful tone is at odds with, for example, phenomenological interpretations of Minimalist sculpture, in which the viewer participated in the work but as a relatively abstract presence. For Hein that viewer becomes a very literal participant who, consciously or otherwise, acts as a trigger for the work.